As religions and society comes full circle to one where individuals are taught to glorify life and not death, there is a slow but strong undercurrent of disinterest, if not hostility, against organized religion. The politer forms are billboards which pronounce upon the virtues of Atheism. "Canada is founded upon principles that recognize the supremacy of God and the rule of law." "... conscious of their responsibility before God." American political pundits note that when Sonia Sotomayor becomes a member of the Supreme Court, there will be six Catholics on that Court of Justice; six persons who have affirmed, and not since renounced, a faith in the existence and paramountcy of God. While the fact might block the nostrils of many an atheist or multiculturalist, the diamond of Christianity has been on the ring finger of the common and civil law since time immemorial, first carried by the Christians and then, once taken by the remnants of the Roman Empire, really took hold. "Ecclesia non moritur: the Church cannot die." England, the ancestral home of the common law, was Christian faith-driven. Even the law took a back seat. "... the Christian religion is part of the law of the land." "The second ground of the law of England is the law of God." Riding a case against the current of the Bible was not good practise. "I will not suffer the Christian religion to be reviled while I sit in this Court and possess the power of preventing it." "The Christian religion is from heaven. "The gates of hell shall not prevail against it and its professors and are not afraid of its being examined. 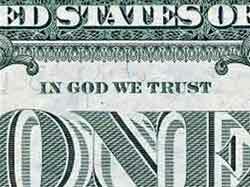 It has stood for eighteen hundreds years and it will stand long." "The Court has no fears for the safety of the Christian religion. It does not believe that the rock upon which Christianity stands can ever be shaken." Who or what is God is different for every believer. For some, it is a way of life; a choice to do in every situation as Jesus or Muhammad would. 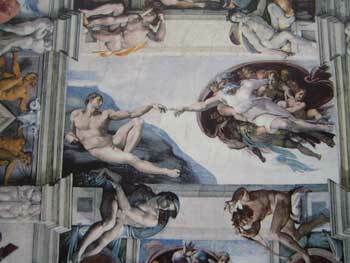 But, admittedly, the concept is as hard to pin down today as it was to the Vatican artist Michelangelo when, hundreds of years ago, he was paid a fortune to simply paint ... God. The first whisper of disassociation between God and law came in 1883 when English judge John Duke Coleridge wrote that it was "no longer true that Christianity is part of the law of the land". Indeed, since, the common law seems to have slowly unhooked itself from the solid but dated anchor of God and Christianity. But religion does not manage change like a corporation, if at all. While oil-rich Muslims defer to God's will as expressed in a 652 book, Christians have to admit of no reformation since 400. Everywhere, stories of Noah's Ark ring hollow but to the aged or the evangelists. As 50-something Christian judges are sworn in while the younger population around them is mostly Atheist or Agnostic, one can only hope that there is replacement ground, yet, to hang on to if and when the multicultural or politically-correct lobby rips our great democratic nations of the God-factor and a compassion-based Christian moral backbone. A growing and strong common intelligence has long left us a problem (long live education!). Ironically, to many discriminate Christians, science holds the key to the law's spiritual icon, God. Increasingly, an answer-seeking human society cannot avoid the anthropic principle which raises the unnerving question that only science can answer: why here, why us, why now? As a law-based and imperfect human society paddles down the river of evolution, it seems more the vacuum of compassion and altruism that the world ought to fear. This weighed heavily in the minds of our common law 19th Century judges and for which, like against the hedonism which has wrought upon us an imminent environmental disaster, there is no answer but individual leadership led by the deft hand of law. And, still, circa 2009, that hand still holds the hand of "God".